Remember how tasking it was to shuffle files between computers just to print something out? Printing documents from a mobile device has kind of been like that. It requires some convulted manuever where you email the document to yourself and then access it from a computer that's connected to a printer. When you're in a rush, that's the last thing you want to deal with. Google tried its hand at simplifying this laborious task by introducing an app and service called Cloud Print. With Android 4.4, it's baked right into the OS (though you can still download the application if you're using an older version of Android). Here's the quick run down on how to use it. 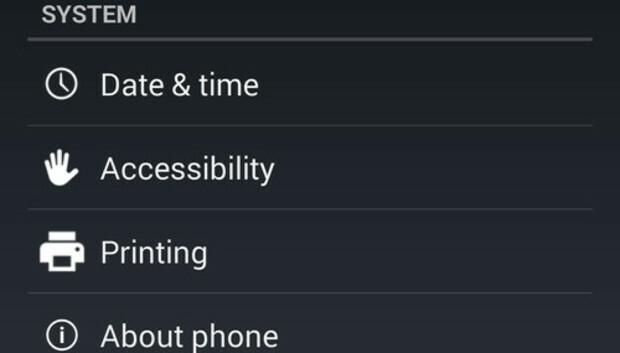 KitKat's printing abilities live deep within the device's Settings panel. To get to them you'll have to scroll all the way down to the System section, and select Printing. From here, you'll see two options for Print Services: Cloud Print and HP Print Service Plugin. If you have a Cloud Print-capable HP printer, you can use the second option to set up your device, otherwise select the Cloud Print option to set up other compatible printers (for a comprehensive list of those printers, check out Google's official FAQ page). Cloud Print will display a list of Printers on the same Wi-Fi network as your device, as well as any that you've linked up with your Google account beforehand. You'll also notice that there is a Save to Google Drive option that will convert any compatible document or photo to a file that can be stored in your Drive account. If you've got what Google calls a "Classic Printer," you can follow company's instructions to set it up with your Google account. Just make sure that the Google account you're using on your Android device is the same one that's associated with your Cloud Print preferences. Hit the Settings button at the bottom of the Cloud Print devices panel to ensure you're logged in with the right Google account. Now that your printing preferences are all set up, you can use an application like Quick Office to send a file to a nearby printer. In Quick Office, grab a file from your Google Drive or from an integrated app like Box. Tap it to open it and then hit the Settings button in the upper right-hand corner. Select Print and Android will pop up a print dialogue window, similar to what your desktop computer does when it's ready to print. From here, you can select how many copies you want, the paper size, whether you want it to print in color or black and white, and the paper orientation. You can even select which pages to print. When you're ready, simply tap Print and watch the cloud magic begin.